The total entry period for inclusion in the competition is from survey launch on 4 April to 11.59pm AEST on 23 April 2019. Three prize draws will occur during this period. Respondents who complete their survey between 4 April and 11.59pm 11 April will be entered into 3 prize draws and be eligible to win a prize in Prize Draw #1, #2 or #3. Respondents who complete their survey between 12 April and 11.59pm 17 April will be entered into 2 prize draws and be eligible to win a prize in Prize Draw #2 or #3. Respondents who complete their survey between 18 April and by 11.59pm 23 April will be entered into one prize draw and will be eligible to win a prize in Prize Draw #3 only . Are you an international student studying in Geelong and want to enhance your employability skills? Or perhaps you are an employee looking to enhance your relationship building, communication & leadership skills? Then join the Study Geelong Career Mentoring Program. It's FREE! For more information read the Student flyer or Mentor flyer (for employees). The Geelong International Student Association and Study Geelong present the Language Social Night - a regular meet-up where tertiary students can exchange language and culture. It is an opportunity to chat, meet new people and practice speaking another language. The idea is: We show what languages we speak or want to practice with flag stickers. The first flag is your native language and goes at the top of your shirt. The rest follow in order of ability. It is open to all nationalities and languages. You don´t have to be an advanced speaker, or even speak a second language - it is for all levels! We would love to see you there! 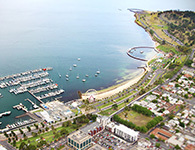 Register on the Study Geelong Facebook Page. This FREE tour for international students, will take in the GMHBA Stadium including the Brownlow Stand, the Media Suites, Sports House, the Opposition Change Rooms and Coaches box, GFC Interactive Zone, Deakin Community Cats Centre, the seating bowl Players Stand, The GFC Coaches Box, Anzac Remembrance Garden and Time-keepers’ areas as well as the Gartland Heritage Centre, just to mention a few. Registrations close 28 March. Register for FREE online here. 14 March, 4.30pm Royal Geelong Yacht Club. This event was a sell out! International students from around the world, studying at secondary schools and higher education institutions in the Geelong region in 2019, enjoyed a taste of Australia as they were welcomed into the community on 14 March. Hosted by Study Geelong, the welcome event was held at the Royal Geelong Yacht Club and with the beautiful backdrop of the harbour, students were officially welcomed by Christine Couzens MP and City of Greater Geelong Councillor Trent Sullivan.Study Geelong consists of eleven educational institutions registered to offer courses to international students within the City of Greater Geelong, as well as support from Tourism Greater Geelong and The Bellarine. On hand to introduce the students to an Australian way of life were native Australian animals such as possums, lizards, pythons and a bettong, Australian Rules Football handball game, giant board games and a novelty photo booth to capture the occasion. A welcome tree from the City of Greater Geelong was available to write messages to other fellow international students and newly arrived residents on leaves and place them on the tree. The afternoon enabled the students to experience the Australian culture, encouraged them to make the most of their stay in Geelong by engaging in community activities, and importantly allowed them to meet other students and feel more comfortable with their new surrounds. The event was supported by Study Melbourne through the International Student Welfare Program. Free tickets - limit one per international student. Places are limited. The Big Bash League is Australia’s most exciting cricket format. Study Melbourne and Cricket Victoria invite you to a great night of entertainment watching the Melbourne Renegades vs Brisbane Heat at GMHBA Stadium Geelong, 6.35pm on 13 January.To register for your ticket click here. The sun shone, the Aussie music played by Pete Chapman created ambience and the native animals were endearing! What a great event this was to celebrate international education in Geelong. This event was held on 23 August at the Geelong Library and Courthouse Youth Arts Centre. Taf Kamba, Associate Nurse Unit Manager at Epworth Geelong. Taf holds a Cert IV Nursing from The Gordon and a Bachelor of Nursing and Masters in Clinical Nursing from Australian Catholic University. Gabrielle Marchetti, principal lawyer at JobWatch, the community legal centre that runs the International Students Work Rights Legal Service. Liz, Creative Director, What Your Customers Want, shared tips and tools to make networking a purposeful and enjoyable experience. Mel, Managing Director, HyperSocial, showed students how to use LinkedIn to build their profile and get noticed. Jodie, Skills and Job Advisor, the Skills and Job Centre, explained how to respond to selection criteria when applying for a job. Tracey, Manager Careers and Training Services, The Gordon, calmed students' interview nerves by preparing them for what they should say, do and wear.